The state of Iowa is planning on bringing cellphone-based driver licenses to its citizens. A native app from the Department of Transportation (DOT) is being discussed, which will contain all the information your driver license holds. The logistics of a smartphone app which contains sensitive information could be tricky but we already live in a world where our credit cards exist on our smartphones. The Des Moines Register posted a report yesterday with more details. The DOT revealed Monday that it's developing a secure mobile app that would contain all the information found on a plastic license along with a scannable bar code linked directly to DOT databases, ensuring the data are verified and up-to-date. In case of a traffic stop, spokesmen for the Iowa State Patrol and Des Moines Police Department both said bar codes contained in the mobile app would have to be scanned using hardware that's inside an officer's cruiser. Driver's therefore would have to hand over their phones to an officer and allow the officer to take it back to the cruiser, noted West Des Moines defense attorney Nicholas Sarcone. That raises all kinds of questions. What id drivers wish to use the phone to record their interactions with the police officer? What if they want to make a call or send a text during a traffic stop - perhaps to a lawyer? What if the phone has a lock mechanism that would lock officers out before they are able to scan the license bar code? Issues like those have been cited as possible roadblocks to adoption of the service. Also, not everyone has the same type of smartphone. Of course, there will still be plastic driver license cards in case of any problems with the app. Also, what happens when you cross state lines? Will other states accept your electronic driver license? Then there are other issues like a dead cell phone battery or cracked screen which does not allow the code to be scanned. What happens then? The issue of handing over your cellphone to an officer to be taken into a cruiser to be scanned, can be eliminated by having handheld scanners which allow drivers to hold on to their phones. Additionally, the U.S. Supreme Court ruled earlier this year that searches of mobile phones require a warrant, meaning a police cannot simply take a driver's phone and scroll through the data stored in it. 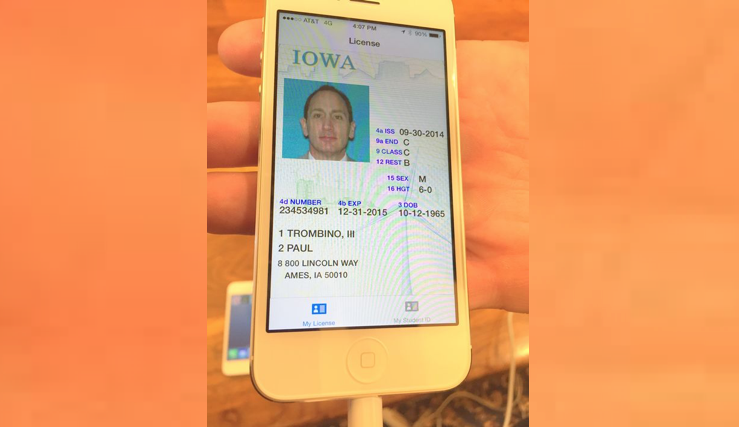 The report in The Des Moines Register outlines additional issues that could arise from having your driver license stored inside a smartphone app. Whether this plan comes to fruition or not, remains to be seen. With Apple Pay, Google Wallet, PayPal and other services allowing users to store payment information in their smartphones, having your driver license in it too will threaten the need to carry a wallet. Iowa is the first state in the U.S. to plan such a move. More states may follow. As long as they find a safe and secure way to implement the technology, we seem headed, slowly but surely, towards a 'walletless' world.